The sanskrit word Jaya means "victory to" or "in celebration of". Jaya Yoga was created in celebration of Yoga all ways. No matter where your yogic path has brought you so far, arriving here, is where you are meant to be. 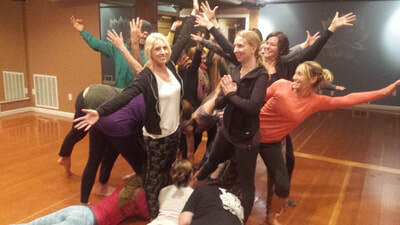 Jaya Yoga Teacher Training celebrates Yoga like no other training program we know of. More than just learning asana and teaching techniques, you will discover true Yoga, the essence of who you are. You will train, personally, with teachers devoted to you and your Yogic discovery. You will become immersed in Yoga with the guidance of your teachers throughout the program. This is how Yoga was traditionally taught. Up to this point, you may have been to different classes, teachers, workshops, retreats, trainings, etc, but now you will become immersed with two complimentary and diverse teachers. Stephanie (Pushti) and Adi are devoted to you and your deeper yogic experience during and even after our training time together. Traditionally, this is how Yoga was passed down through the ages. While it can be fun and fashionable and even feel safe to go from conference to conference to training to workshop to class, this can also be a way to avoid intimacy, vulnerability, or to truly be seen. Without a long-term teacher, no one to consistently see your progression and practice in your Yoga training, you may feel something missing in the dedication and devotion you experience on your path. We provide Yoga Alliance-approved 200-Hour Teacher Training (and a 500 hour training that is offered in 5 one-week intensives). Our program exceeds the basic requirements of Yoga Alliance in many ways, but, most importantly, will teach you how to use your strengths to truly connect with the students you teach. Cost: ​$2685 total for Part 1 and 2 (if paying in full for each segment). 6 Month payment plan includes a $50 administrative fee. 12 month payment plan includes a $100 administrative fee. To register email floweventsmanager@gmail.com, or call 541-FUN-YOGA (386-9642) between 9-2 Monday through Friday or 9-12 on Saturday. *In 2020 we will, again, be offering Part 1 as four weekends Feb-May, and Part 2 the first two weeks of August. We understand that your life is busy and there are often many other commitments you need to consider before diving into a 200 hour training program. After years of experience leading trainings, we have determined a balanced training schedule that allows our students to best absorb the breadth of the training program, as well as, honor those modern life commitments (family, work, finances, and personal time). Our training program is broken into two distinct parts: Part 1 containing the first 100 hours of our training, and Part 2 with the second 100 hours completing the RYT200 certification. These workshops must be taken consecutively as the information offered in the workshops will build on each another. You may, however, take additional time between Parts 1 & 2 as is needed for your finances or schedule. This 3-Day Training is an immersion into learning a dynamic style of hatha/vinyasa that focuses on sustainability and prehabiliation AND an in-depth experience of the 8 Limbs of Yoga. This workshop teaches simple principles of alignment in fundamental Vinyasa poses based on essentials of hatha yoga biomechanics. This training will give you options to refine your practice and teaching to become even more sustainable regardless of your lineage or dedicated asana style. These functional fundamentals can help to prevent yoga injury especially in areas most prone to injury in modern active yoga styles: the wrist, lumbar and cervical spine, and hips/knees! ​Aligning with the sacred energy flow of the body is the simplest way to tap into your pranic vitality and return to the natural alignment that is your true nature. Learn simple principles of alignment in fundamental Vinyasa poses based on essentials of hatha yoga biomechanics. This training will give you options to refine your practice and teachings to become even more sustainable regardless of your lineage or dedicated asana style. These functional fundamentals can help to prevent yoga injury especially in areas most prone to injury in modern active yoga styles: the wrist, lumbar and cervical spine, and hips/knees! Sustainable Yogasana creates a good understanding, body awareness, and integration between yoga therapeutics and more active styles of yoga. There is so much great information out there about teaching to different ages and stages of life. Stephanie has taken the vast amount of options and information available for modifying the traditional practices for specialty populations into the most practical and powerful. Learn the most important considerations for modifying classes for pregnancy, seniors, obesity, and fun and playful formats for teaching to kids. This is a training for every body and will include adaptive options for stress reduction for optimal health for every age and stage. ​Yoga is a gift. We can create connection and community in many ways. One natural way we express connection is through touch and physical support. 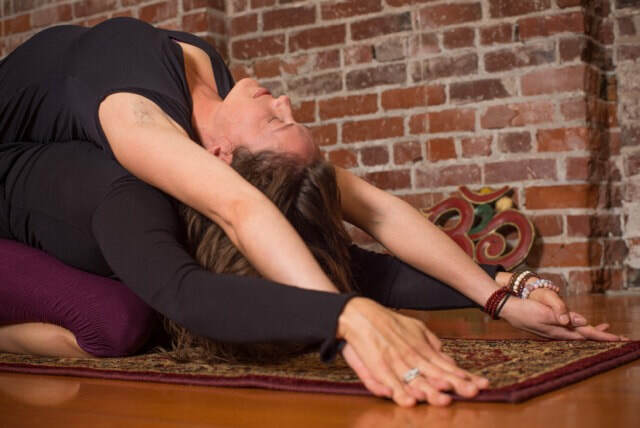 This 5 hour teacher training workshop will focus on assisting and adjusting asana to both connect and to guide. 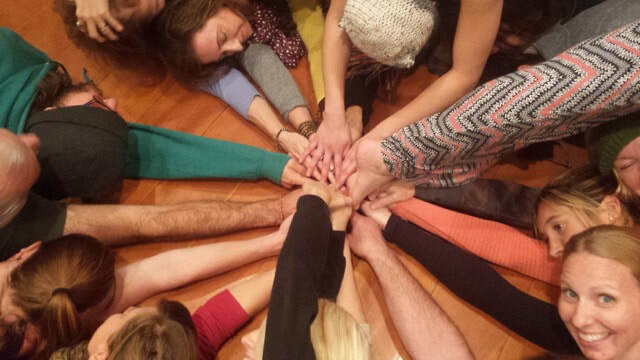 Healing through touch by bringing aligned balance to our students' bodies. Over 80 asana/postures/modifications/vinyasas (some unique to Jaya Yoga) from an alignment, kinesiology, and energetic perspective. We explore asana thoroughly to balance the muscles and prevent yoga injury, looking at asana together as standing poses, backbends, forward bends, twists, arm balances and inversions. Kinesiology is the study of movement, performance, and function by applying the sciences of biomechanics, anatomy, physiology, and psychology. From a yogic perspective, we look deeply into the poses and apply the ancient science of bandhas (energetic seals/locks) with modern functional strength/muscle balancing. Additionally, we take into consideration skeletal anatomy and develop an understanding of the physiology of stretching to "see" both the benefits and limitations of asana to balance the physical body. Discussion of common yoga injuries and how to prevent them through progression, modifications, and options. We develop an understanding of the subtle energy body: koshas, chakras, rasas and nadis, and understand the benefit of pranayama, kriya, mudra, and asana to connect with the inherent vital energy that we are. We will review up to 30 kriyas, many unique to Jaya Yoga. Kriyas are mental and physical fluid meditations. Kriyas are not well known or understood in the West, yet are a primary practice in India, where yoga began. At the 200 hour level, we deeply study Patanjali's Yoga Sutras, including the essentials of Yoga philosophy, the 3-Step Plan, 8 Limbed System, and Yamas and Niyamas. In celebration of yoga all ways, we look at the "family tree" of the major lineages of Eastern and Western Yoga Traditions, older & contemporary, to understand the styles and traditions emerging today. Sanskrit pronunciation and practice for both asana and yogic terms. Support in developing your authentic teaching voice and language. Energetically balancing our classes with hatha and vinyasa. The energetic and physical practices of mantra and mudra will be introduced and practiced, including practical ways you can incorporate them into classes. Meditation and pratyahara (sense withdrawal) will be daily practice using a variety of techniques, as will the other limbs of the 8-limbed system. Mindful Adjustments. Learning to connect individually and energetically with students first, and secondly, through visual, verbal, and touch. Physical adjustments are an advanced teaching technique that should be applied with experience once a teacher has become comfortable with teaching technique and creating connection. Practice teaching experience through observation and assisting in classes with your peers. As you compare different programs and schools, feel free to ask lots of questions about the program and the experience of the Trainers. Not only how long have they been practicing or teaching Yoga, but how long have they been training teachers. Another thing to consider is how many students will be allowed into the program. It is of the utmost importance to us that we have enough people to generate energy and support, but not so many that we are limited in our personal connection to each student. Adi and Stephanie have been taught by master teachers in the U.S. and India and have taken a variety of trainings around the world to ensure that we are providing classes to inspire the mind, awaken the spirit, and bring vital energy into the body. There are many newer teachers who put together teacher trainings and many of them have only been trained in one style of asana. Our teacher trainers have been trained in many forms of vinyasa/astanga/power, bihar, kriya/kundalini, yin, Iyengar, partner/acro, Pranava, and therapeutic/viniyoga. Stephanie has been practicing asana regularly since 1994 (25 years), and training Yoga teachers and developing curriculum for Yoga Alliance-approved training programs nearly full-time since 2000 (nearly 20 years). Adi has been teaching the heart of Yoga since he first had the highest samadhi experience in 2003. THIS is our lives' work, THIS is what we are here to do. We have 40 combined years of full-time teaching. Is Jaya Yoga Right for You? Jaya Yoga will challenge your body and mind, and open your heart, if you let it. We will ask a lot from you, and you will get back, what you give. Once you commit to this program, your practice, and your overall well-being...you "catch" Yoga, you become Yoga. You relax into life with the most vital energy you've ever known. We offer a 3-Day Foundations Training so that you can meet your potential teachers and get a deep sense and feeling for what this style/approach is founded upon. If your heart is inspired toward the Jaya Yoga path, you can choose to enter either at the 200-hour or 500-hour level (if you already have your RYT 200). We have learned over the last twenty years a few key things about how yoga teachers learn and grow. The Intensive environment provides for a “pattern interrupt” which helps to transform and breakthrough habitual thinking that is essential for deepening awareness. However, a one-month intensive is exhausting and doesn’t provide time to go out into the real world and apply what you’ve learned and come back for more practice and continued learning. So, we are offering intensive weekends, weeks and two-week programs that you can work to fit your schedule. How do the Intensives in Hood River Work? Stephanie arranges local lodging, nearby rooms, and/or ahostel that range in price from about $100-300/week. You choose where you want to be depending upon your needs and circumstances and level of privacy you require. For example, if you will be traveling without a car, we will do our best to place you in a room within walking distance to the studio or you can share rides with others staying in the same lodging. Food,lodging,andtransportationtoHoodRiverareyourownexpense,butwewillhelpyou coordinate rides, etc, from the airport, if needed. Each training includes comprehensive teacher training manuals. A list of other required books will be emailed to you after you register. We have carefully considered which books are most essential to a yoga teacher's reference library - you will use these again and again. The 2-week intensives are called "Intensive" for a reason. If you commit to this program, please leave all other work or obligations at home. During the free time you do have, there will be some reading, etc, required, and/or you will be really encouraged to be "free" in that time - you will need the brain and body break! Ifyouwanttobringyourfamilyforpartofthetimetoa2-WeekIntensive,sotheycanenjoy the many fun and family-friendly activities in Hood River, you can rent a house in the area through the vacation rentals that are here. Our entire RYT200 training comes to $2685. A $500 deposit is required to hold your space in the training. This includes all workshops (Part 1 & 2), as well as, the online SAYF Certification and exam. You may pay for Part 1 & 2 separately as you attend, or set up a monthly payment plan to keep you on track leading up to the training. We do offer a 6 month or 12 month payment plan (some additional processing fees required). Your balance must be paid in full by the conclusion of your training. In special circumstances we can offer a payment plan extension, please contact our training manager to see if you qualify. A yoga teacher training is and should be an intentional, personal relationship with both yourself and your inner growth, as well as with your teacher trainers and the information that is presented. We would love to have a personal conversation with you regarding our program and your interests to make sure that we are a good fit for you and your needs. To register please contact us expressing your interest and any remaining questions you may have regarding the Jaya Training Program. You may also directly register for our upcoming trainings and workshops online. “First I want to thank you so much for the incredible weekend. I feel so happy and focused and calm and excited and emotional (all those at once) to continue my learning with you both, with Jaya Yoga. I feel very clear about this—pursuing a path that manifests as supporting others has been in my mind and heart for over 20 years—should I get a graduate degree in psychology? Should I enter into energy work? Life coach? Yoga teacher? I am clear now about the path—this is huge for me (and for my family, who has been observing this spinning wheel in my mind for a long time). As a dancer, and as a support person in my work and family and life, yoga is the magic combination of movement and expression and quiet and compassion and challenge and joy for me. The universe seems to be offering me openings in this regard right now, and I can’t explain why this is, but know I would like to move forward. I was deeply moved by the weekend, and humbled by all there is to learn—you know the old adage, the more you know, the more you don’t know!